Welcome to the fifth episode of Safe for Democracy, the podcast about the foreign policy disasters of the United States in the 20th century. 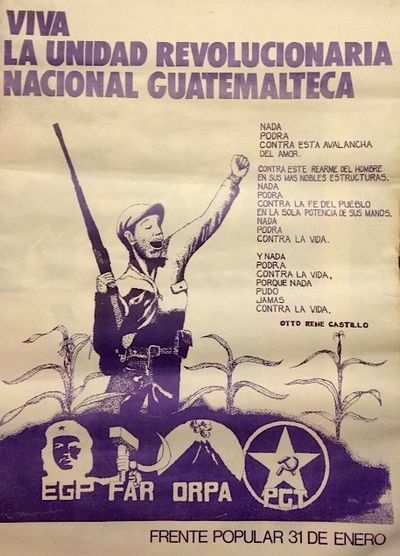 This is the fourth part of a series exploring the violent aftermath of the US-backed coup against Jacobo Arbenz in Guatemala in 1954, which was itself the subject of the first show. Maybe some photos this time for context? Up at the top there is General Efraín Ríos Montt, found guilty of genocide, hanging out with Ronald Reagan, who once said that the Guatemalan government had gotten a “bad rap” from the liberal press. Reagan went on to give the man tens of million dollars in arms. Here we’ve got what’s basically the letterhead of the EGP, the Ejercito Guerrillero de los Pobres, or the Guerrilla Army of the Poor. Their actual emblem is up at the top left, Che Guevara’s Korda Photograph in high relief with EGP down at the bottom. It’s not easy to see from college campuses in the US, but actual revolutionaries also revered Ernesto. Especially appropriate since Che participated in the Agrarian Reform in the 1950s, and it was the US coup in 1954 that convinced him that the only way forward against imperial powers like the US was armed revolutionary action. This is the emblem of the Organización del Pueblo en Armas, or the Organization of the People in Arms. I’m no expert in Guatemalan culture, but if its mythology is anything like Mexico’s, the volcano is a deeply national and deeply indigenous symbol of power and strength. Hey everybody, and welcome to the fourth episode of Safe for Democracy, the podcast about the foreign policy disasters of the United States in the 20th century. This is the third part of a series exploring the violent aftermath of the US-backed coup against Jacobo Arbenz in Guatemala in 1954. If you’re just now coming to the podcast, it’d probably be best to start with episode one, which tackles the coup, and then come through the Aftermath in order. But if that’s not your game, fair enough, start right here. Last time we had a brief respite, tackling Liberation Theology, social Catholicism, jungle collectives, and the spirit of indigenous pride that had Mayas all over Guatemala taking to the streets and demanding their fundamental right to life and to culture. We left off with General Kjell Eugenio Laugerud García in the Presidential Palace, and his relative leniency, after the murderous regime of the Butcher of Zacapa, Colonel Arana Osorio, was allowing Guatemalan civil society to flourish for the first time in decades. That interstitial period is about to end, though, with the fraudulent election of General Fernando Romeo Lucas Garcia, who will take a less generous view of what he sees as traitorous elements in the country. La violencia and tierra arrasada are still one episode away, so we’ve got three more weeks to worry yet, but we won’t get all the way through this one unscathed either. This time around, it’s earthquakes, committees of campesino unity, massacre in Panzos, and the helping hand of Ronald Reagan, as always, making war to make the world safe for democracy. Maps and ephemera follow for anyone who’s game.